Simon Bonney & Bronwyn Adams (1993). Photo credit Gareth Jones. Recording the "Everyman" album. 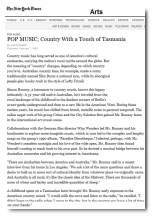 related to the Australian artist Simon Bonney. 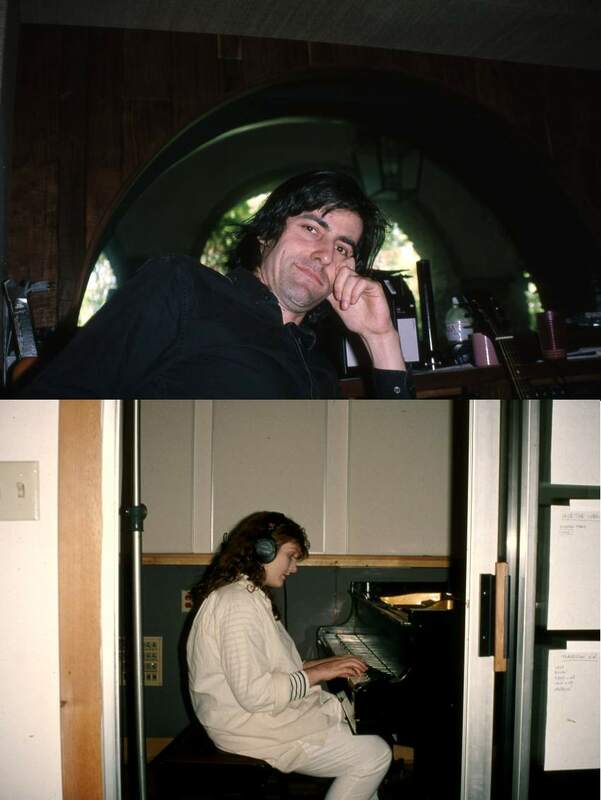 The year in which the recording sessions for the "Forever" album start and Simon and Bronwyn move to Los Angeles, CA (US). "Simon and Bronwyn had taken their Alcoholics Anonymous/Narcotics Anonymous programs as an excuse to withdraw from the rest of [Crime and the City Solution]. In reality, however, Simon was planning a solo career for which he saved up his songs. Our distrust and his eventual obvious betrayal led, after less than five years, to the dissolution of [Crime and the City Solution] in this line-up. Three great albums were created as part of this collaboration and it was a shame that the vain megalomania of the singer stifled the just emerging success of this promising project in the bud. I was deeply disappointed in the man and never again wanted to have anything to do with him." (Alex Hacke in his 2015 autobiography "Krach", translated from German). Twenty years later, in 2011, Alex would play a key role in helping Simon resurrect Crime. They record in Detroit a new album, "American Twilight", and tour Europe, USA and Australia during 2012-2013. Simon Bonney (vocals) and Bronwyn Adams (violin). DE Recording sessions for the "Forever" album @ Audio, Spliff, Acoustic Heidiland and Tritonus studios, Berlin. Mixed @ Tritonus studio, Berlin by Gareth Jones, assisted by Marco Birkner. Produced by Gareth Jones. With Hans Behrendt (percussion), Reinhold Heil (organ,piano), Jayney Klimek and Nikko Weidemann. 1991. Simon Bonney and Bronwyn Adams move to Los Angeles, CA (US), where they would be living until 2001. US Recording sessions for the "Forever" album @ Trax and Wayne Cook studios, Los Angeles,CA (US). Engineered by Mike Nally, with Bradley Cook. Produced by Gareth Jones. With John David Foster (acoustic/electric guitars)/ Jon Dee Graham (steel guitar, dobro, bottle-neck guitar)/ Gregory Boaz (electric and upright bass) and Archie Francis (drums). With Harold -Biff- Sanders (drums) and on backing vocals Sally Norvell and Carla Bozulich. The year in which the "Forever"album is released, followed by an acoustic tour of the USA. UK Release of the "There Can Only Be One" single (Mute records). UK Release of the "Forever" album (Mute records). US Release of the "Forever" album (Mute/Elektra records). 1992. 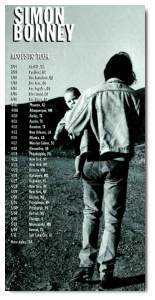 Simon and Bronwyn (then pregant) with their 6 months old daughter take a the road trip across America (along Route 40) from their newly adopted home in Los Angeles to New York City, to play a series of acoustic shows. Simon Bonney (vocals)/ Bronwyn Adams (backing vocals) and John David Foster (acoustic guitar). Setlist: Where Trouble Is Easier To Find(*)/ Sweetest Kind Of Pain/ Forever/ Ruby(*)/ Someone Loves You/ Like Caesar Needs A Brutus/ Don't Walk Away From Love(*)/ Saw You Falling/ The Sun Don't Shine. Note: Acoustic set. (*)Songs from the, at the time, unrecorded "Everyman" album. The years in which the "Everyman" album is recorded. Simon Bonney (vocals)/ Bronwyn Adams (violin/backing vocals)/ John David Foster (guitar) and David Halley (guitar). 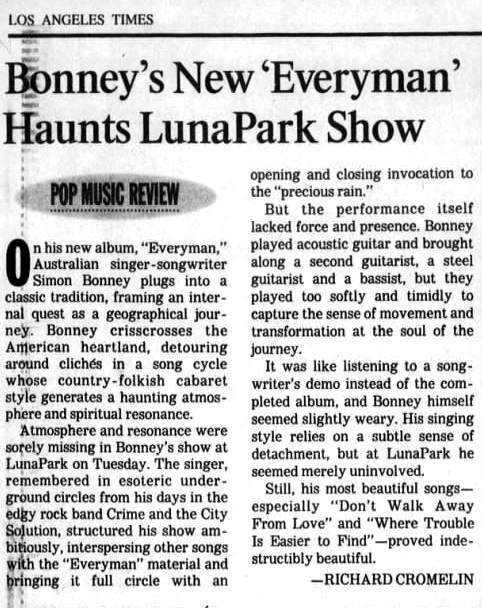 Ad: Taken from the New York Times online archives 07-Feb-93. Note: Month residency on Tuesdays/Wednesdays. US Recording sessions for the "Everyman" album @ (Willie Nelson's) Pedernales Recording, Lake Travis, TX (US) and Arlyn studios, Austin, TX (US), and Bismeaux studio, Austin, TX (US). Engineered by Stuart Sullivan. Produced by Gareth Jones. Further recordings @ Clubhouse & Kiva West & Trax & Stagg Street & Studio Masters studios, Los Angeles, CA (US). Line-up: Simon Bonney (vocals)/ Bronwyn Adams (violin)/ John David Foster (guitar/co-wrote music) and David Halley (guitar). With Jon Dee Graham (pedal steel guitar)/ Chuck Prophet (guitar)/ Matt Smith (guitar, piano, organ)/ Skip Edwards (organ, electric piano) and Daren Hess (drums, percussion). With the Texacali Horns: Joe Sublett (saxes), Darrel Leonard (trumpets, trombonium), and Frank Kammerdiener (cello), John Hagen (cello), Freddy Krc (drums, percussion). On backing vocals: Sally Norvell, Jayney Klimek, Jon Dee Forster, Matt Smith, Chris O'Connel, Maryann Price and Gareth Jones. Photo: Photo credit Gareth Jones. 1994. Temporarily moving back to Australia. UK Additional recording sessions for the "Everyman" album @ Milo & The Strongroom studios, London. The year in which the "Everyman" album is released, followed by 3 tours of the US. US Release of the "Everyman" album (Elektra records). Simon Bonney (vocals)/ Bronwyn Adams (violin)/ Peter Angus (bass)/ Jeremy Wakefield (pedal-steel guitar) and Matthew Smith (acoustic guitar). 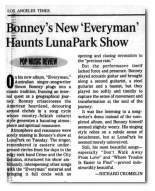 Note: Start of a (36-date) US tour in support of the "Everyman" album, with strong support from Elektra Records. Simon plays intimate venues with three other musicians, incorporating a combination of pedal steel, dobro, lap steel, guitar, mandolin and violin. Setlist: Where Trouble Is Easier To Find/ Forever/ Western Lights/ All God's Children. Setlist: Where Trouble Is Easier To Find/ Someone Love's You/ Forever/ Don't Walk Away From Love/ All God's Children/ Western Lights/ A White Suit In Memphis/ Like Caesar Needs A Brutus/ Ravenswood/ Good Time Charlie's Got The Blues [Danny O'Keefe]. 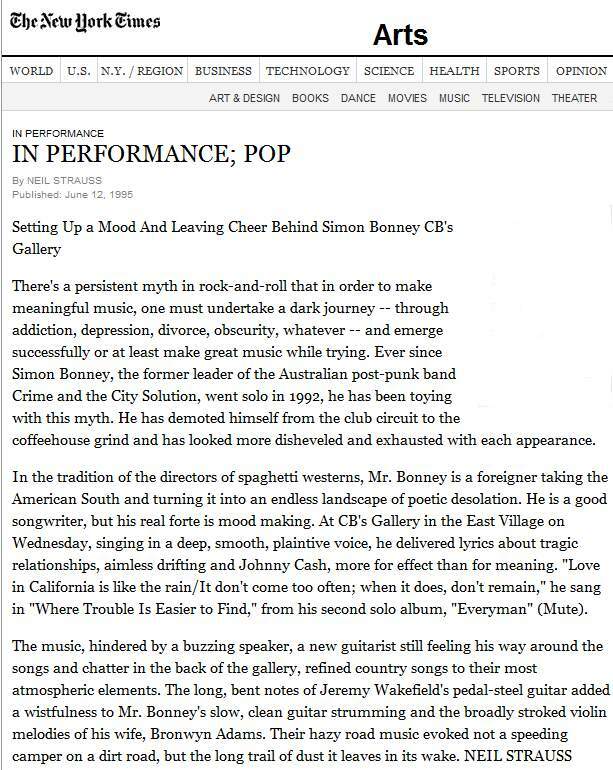 Review: Scan of review, taken from the Los Angeles Times. Ad: Taken from the Gavin Report 31-Mar-95. Setlist: Ravenswood/ Don't Walk Away From Love/ A White Suit In Memphis/ All God's Children/ Forever/ Where Trouble Is Easier To Find/ Unchained Melody [Righteous Brothers]/ Western Lights. Setlist: a.o. Like Caesar Needs A Brutus/ A White Suit In Memphis/ Someone Loves You. Setlist: Ravenswood/ Don't Walk Away From Love/ A White Suit In Memphis/ All God's Children/ Forever/ Where Trouble Is Easier To Find/ Unchained Melody [Righteous Brothers]/ Western Lights/ Like Caesar Needs A Brutus/ Ravenswood (reprise)/ Someone Loves You. Setlist: Ravenswood/ Don't Walk Away From Love/ A White Suit In Memphis/ All God's Children/ Forever/ Where Trouble Is Easier To Find/ Unchained Melody [Righteous Brothers]/ Western Lights/ Like Caesar Needs A Brutus. Note: Final dates on first US tour. Simon Bonney (vocals)/ Bronwyn Adams (violin/backing vocals)/ Jeremy Wakefield (pedal-steel guitar) and Matthew Smith (guitar). Note: Second US tour, in support of other bands. 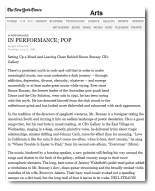 Review: Review by Neil Strauss, taken from the New York Times online archives 12-Jun-95. Note: End of second US tour. Note: Third and final US tour, presumably only a few dates in the NY area. Line-up? The year in which the third album "Eye's Of Blue" is recorded. Simon Bonney (vocals)/Bronwyn Adams (violin)/ Larry Ray (guitar)/ Matthew Smith (keyboards)/ Troy Gregory (bass) and Jim White (drums). UK Release of the "Don't Walk Away From Love" single (Mute records). UK Release of the "Everyman" album (Mute records). US Recording sessions for the "Eyes Of Blue" album @ Tempermill Studios, Ferndale-Detroit, MI (US). With Larry Ray [Outrageous Cherry], Matthew Smith [Outrageous Cherry, Volebeats and (later) Crime & the City Solution], Troy Gregory [The Dirtbombs, Swans, Prong, Killing Joke, Spiritualized and Crime & the City Solution] and Jim White [Dirty Three, Nick Cave and (later) Crime & the City Solution]. The album remains unreleased to date. The years in which Simon is working in the film industry in Los Angeles. 1996-2000. Simon Bonney is working in the film industry in Los Angeles, CA (US). First (1996-1998) as a truck driver. He obtained his driving licence @ the El Camino trucking school in Palmdale, East LA. As a Teamster he drives 10-wheelers, presumably transporting equipment from and to film sets. 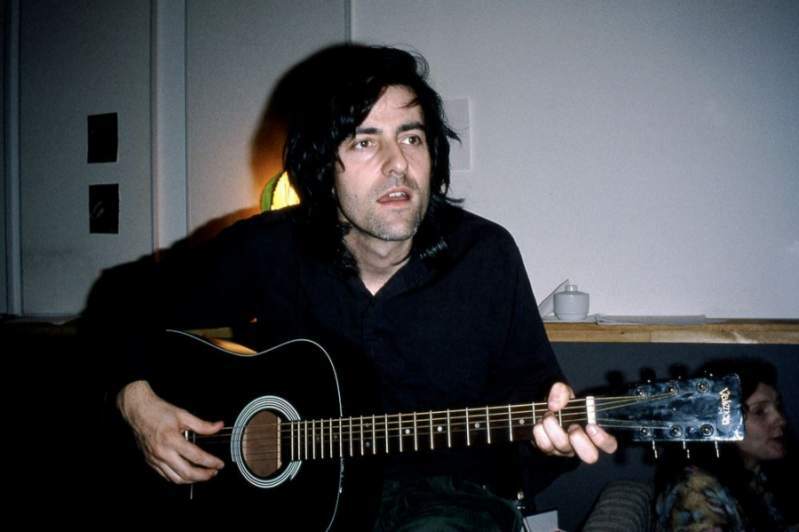 Simon has done somewhat similar manual work as a roadie on Scratch Acid's European tour (December 1986/January 1987) and as lighting engineer on the Bad Seeds North American tour (Sep/Oct 1990). Later (1998-2000) he works as (key) grip on 14 films, with a tiny acting part in one. In 2000 Simon attends a film directors course @ The American Film Institute's Center For Advanced Film & TV Studies in Los Angeles,CA (US). In December 2000 @ the Actors workshop, Simon Bonney directs students for a scene based on "A Gentle Woman" ("Une femme douce", a 1969 French drama) by Robert Bresson. In 2001 Simon returns to Sydney, Australia (Bronwyn and the 2 kids had returned the year before) to study for a degree (Master Of Fine Arts) @ the Sydney Film School. In 2011, Simon and Alex Hacke resurrect Crime and the City Solution . They record in Detroit (@ Tempermill Studios) a new album, "American Twilight", and tour Europe, USA and Australia during 2012-2013. Last modified 30th of March, 2018.